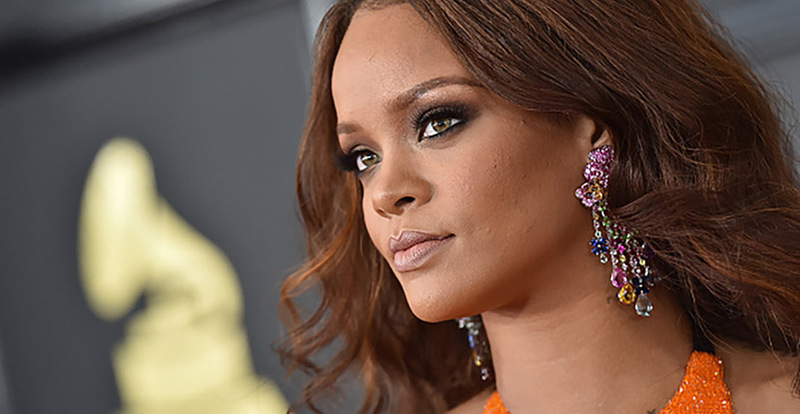 No one wears jewelry like Rihanna. She always, well you know, shines bright like a diamond by piling on pieces for her red-carpet appearances in personal and unexpected ways. The Love on the Brain singer’s high-low combos include t-shirts and major jewelry. Body chains and couture is another pairing she has pulled off to perfection. Chopard is one of the names that has been among her masterful mix repeatedly over the years. On Friday, the Swiss jeweler announced they had taken the relationship to the next level, so to speak, with the Rihanna ♥ Chopard collection. Clearly, she has been enthusiastic about the jewelry. Rihanna did not wait for the April 17, 2017 announcement to wear it. She has been flaunting the pieces in plain sight for months. At the Grammys on February 12, 2017, she appeared in a pair of one-of-a-kind colorful chandelier earrings featuring flowers and butterflies that were inspired by the nature in the singer’s homeland, Barbados. The jewels are set with a rainbow of 13 different gems including multicolor sapphires, tsavorites, rubellites, green beryls, aquamarines, Paraíba tourmalines, rubies, amethysts, topazes, lazulites and diamonds. 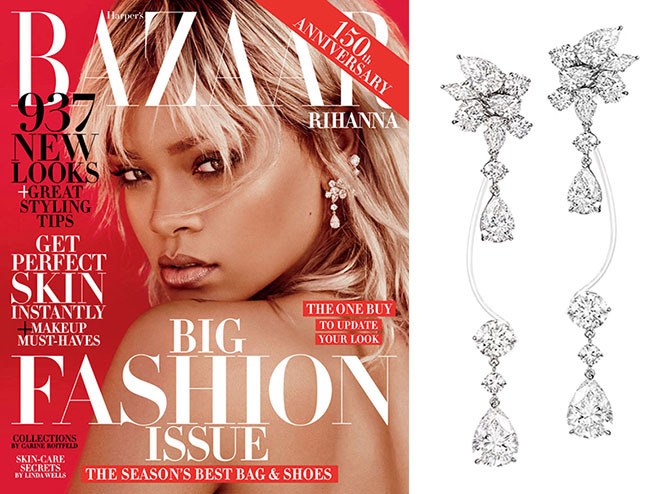 Rihanna’s wide ranging taste in jewels is reflected in the collection. The other earrings in the collab are actually not exactly earrings. They are limited edition transformable ear clips set with 17.18 carats of round, pear, oval and marquise cut diamonds. Rihanna couldn’t wait to wear these either. She put one on for her March 2017 Harper’s Bazaar cover shoot. The jewels Rihanna did not wear in advance of the official announcement of the collaboration are more every day styles. Well, not exactly every day of course. They have the Rihanna spin. The limited-edition capsule collection features pink gold elements decorated in Chopard’s signature Ice Cube design and ceramic motifs in the Jungle Green. Rihanna chose the color for the pieces that happen to match her eyes. Some of the fun silhouettes include bar rings and slender bangle bracelets. Several jewels from the nine piece collection can be seen on Rihanna in the striking advertising campaign (below) that is being rolled out this month. 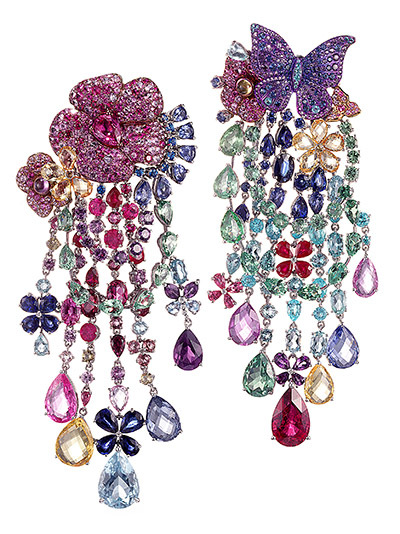 Jewels from the collection can be pre-ordered on Chopard.com. They will be launched officially launched at the Cannes Film Festival in May in celebration of Chopard’s 20th anniversary as an official sponsor.